Chicago-Kent students worked with local attorneys in the Chicago Intellectual Property Alliance (CIPA) to judge entries for the CIPA "Most Inventive" awards at the Chicago Student Science Fair. The science fair was held on March 27-April 2, 2006 at the Museum of Science and Industry. Professor Tim Holbrook is currently a scholar-in-residence at Central European University's Center for Media and Communication Studies. He is meeting with students and scholars from CEU and elsewhere to discuss intellectual property and media, and is researching Hungarian intellectual property law in light of Hungary's transition from a communist system to a free market system and finally to an integral part of the single European Union market. Professor Holbrook will be back in Chicago at the end of the semester, and will be teaching courses in Patent Law, Patent Litigation, and Trademark Law in the coming academic year. During Spring Break, Professor Dinwoodie was invited to lecture at the School of American Law at the University of Gdansk in Poland. While there, he spoke on topics in European and U.S. intellectual property law, and met informally with Polish students and lawyers interested in developing careers in intellectual property law. Professor Dinwoodie conducts an informal meeting with students at the University of Gdansk. The Chicago-Kent team of Steven Jinks and Moshe Wilensky were named the best oralists in the regional round of the 2006 Giles Rich Patent Moot Court Competition, continuing the successes of Chicago-Kent Giles Rich teams over the past few years. Additional information can be found on the IP Moot Court page. 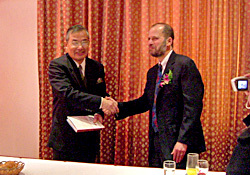 Chicago-Kent College of Law/IIT, The School of Intellectual Property of Shanghai University (SU), and the American International Education Foundation (AIEF) reached agreement and signed a Memorandum of Understanding (MOU) on November 29, 2005. The MOU covers a wide range of professional program types including degree, certificate, and IP training, endorsed by both the Chinese and the U.S. government, and is the very first IP Program of its kind signed in China. It is expected that this long-term relationship will benefit both schools and both countries in expanding knowledge and expertise in the fields of intellectual property law, business, and public administration. 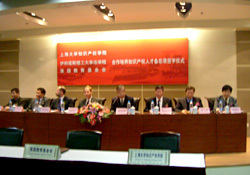 Shown (left to right) are Dr. Zhang Wu, Director of Foreign Affairs of SU, Mr. Arthur Wah, Director of Asian Programs, Chicago-Kent Dean Harold J. Krent, Mr. Kenneth Jarrett, U.S. Consul General, Dr. Chou ZhiWei, Executive Vice President of SU, Mr. Chen ZhiXing, Director General of Shanghai IP Administration, Dr. Xia, President of China Operation of AIEF, Mr. Tao XinLiang, Dean of School of IP, SU. Dean Krent and Dr. Chou ZhiXing exchanging book after ceremony. Jason Gordon and Robert Newman survived five rounds of argument at the 8th Annual National Entertainment Law Moot Court Competition at Pepperdine University, November 11-13, 2005. They also placed second for their Respondents' brief. Please visit the IP Moot Court page for additional information. Shown (left to right) are Adjunct Professor Robert M. Barrett, CIPA president and head of Bell, Boyd & Lloyd LLC's Patent Practice Group; Circuit Judge Alvin A. Schall, Chief Circuit Judge Paul R. Michel; Circuit Judge Arthur J. Gajarsa; and Chicago-Kent Dean Harold J. Krent. Chicago-Kent played host to the U.S. Court of Appeals for the Federal Circuit during the week of November 7, 2005. The court is most widely known for its role in intellectual property: the Federal Circuit has jurisdiction to hear all cases across the United States that arise in whole or in part under the U.S. patent laws. The court came to Chicago in response to an invitation from a number of Chicago-based groups, including the Chicago Intellectual Property Alliance (of which Chicago-Kent is a founding member) and the Intellectual Property Alliance of Chicago. Students seeking to participate in this year's intellectual property moot court competitions should email their interest to Professor Piatt by September 15, 2005. Details of the IP Moot Court Competitions are available on the Moot Court page.